Keio Plaza Hotel Tokyo (KPH), one of Japan’s most prestigious international hotels located in Shinjuku, Tokyo, is currently renovating its Sky Lounge “Aurora” to be reopened on December 7, 2016. 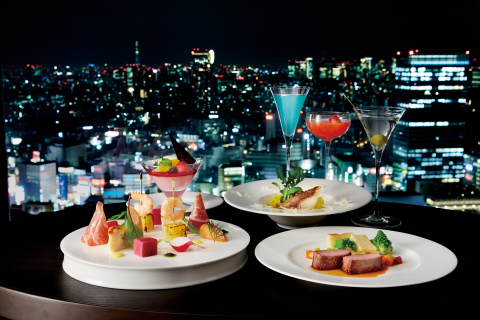 The renovated “Aurora” will provide customers with both a stylish dining environment and panoramic views of Tokyo City from the 160 meter high 45th floor of the Keio Plaza Hotel. Moreover, our hotel’s renowned and talented bartenders and chefs will prepare a wide range of delicious drinks and food items for customers to enjoy at both lunchtime on weekends and holidays only and in the afternoon to late evening hours every day. We are creating seating in the Sky Lounge “Aurora” specially designed to highlight the panoramic views of the Tokyo city skyline and to provide both Japanese and overseas visitors with lovely and memorable dining experiences. The interior of Aurora uses black and white coloring to create a simple and stylish atmosphere within the lounge. It is also accentuated by wooden screens to provide customers with opportunities to enjoy private dining space. In keeping with the reputation of the Keio Plaza Hotel as Japan’s first skyscraper hotel, we are spending about JPY140 million on this renovation to highlight the beautiful views from “Aurora”. Keio Plaza Hotel Tokyo (KPH), located in Shinjuku at the very heart of the nation’s capital Tokyo, is one of Japan’s leading international hotels. Our hotel boasts of over 20 restaurants and bars, and we host a wide range of local and international guests who visit us for our welcoming facilities, warm hospitality and unique services to experience Japanese culture, including our Hello Kitty themed rooms, trial of wedding kimono, tea ceremony and many others. For more information about our facilities and services, please visit our website, YouTube, Facebook or Instagram.